Candy Bar Caramel Apples are a decadent way to enjoy a serving of fruit! 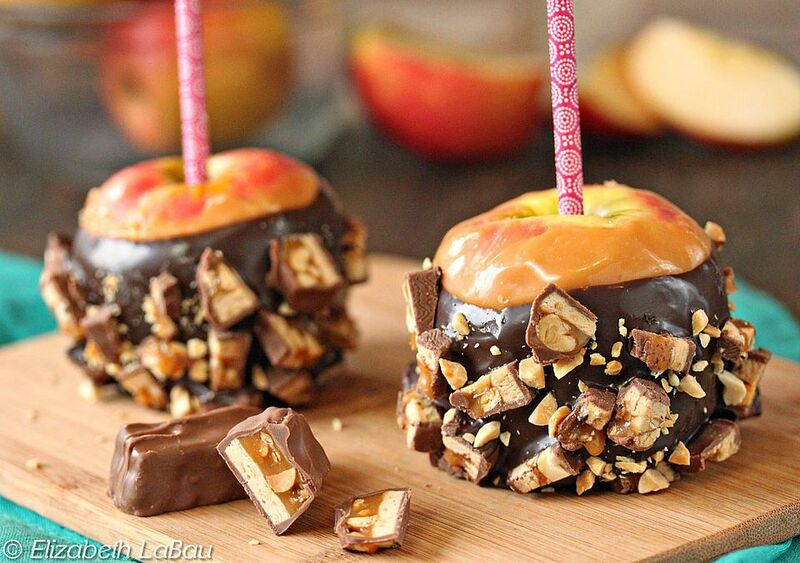 Crisp apples are covered with a layer of caramel, a layer of chocolate, and a coating of chopped candy bars. I like to use Snickers bars, because the chocolate and the caramel of the apple is a nice accompaniment to the peanut-nougat flavor of the Snickers, but any chopped candy you enjoy will work. If you don’t have wooden skewers, you can substitute chopsticks or popsicle sticks instead. Prepare a baking sheet by lining it with aluminum foil and spraying the foil with nonstick cooking spray. Place the chopped candy bars into a bowl. Wash and dry the apples carefully. Remove the stems, and stick the skewers firmly in the stem ends. Hold an apple by the skewer and dip it in the caramel, tilting the bowl at an angle and rotating the apple to cover it completely with a smooth, even layer. Bring it out of the caramel and twirl it upside down to remove excess, then set it on the prepared baking sheet. Repeat with remaining apples. Place the caramel-covered apples in the refrigerator to set for at least 30 minutes. Place the chocolate or chocolate candy coating in a microwave-safe bowl and microwave until melted, stirring every 45 seconds. Dip the caramel-covered apple in the chocolate, until the caramel is almost entirely covered. If it helps, use a spoon to pour some of the chocolate over the caramel to get even coverage. While the chocolate is still wet, press some chopped candy bars into the chocolate, placing them in an even layer around the apple. Place the apple back on the baking sheet and repeat with remaining apples.